As last week's silver price action demonstrated, the correlation between the dollar and metals market has been strange recently. Remember, the downbeat jobs report tanked the dollar and boosted silver prices two weeks ago. And that silver strength continued to follow through in the first half of last trading week. Then, something bizarre happened. As the U.S. Dollar Index (DXY) regained some strength, the silver price continued to rise. We already know that precious metals tend to move inversely to the dollar, but there are times when the trend doesn't hold. In fact, there have been multiyear periods when the two move in the same direction. Despite the rising dollar, silver's recent strength has taken the metal's price back above $17. Today, I'm going to look at three recent and upcoming events and what they mean for the price of silver in the near term. After finishing the previous week strong, silver prices kicked off last week on a quiet note. The white metal opened at $16.39, but moved only slightly higher on the back of a weakening U.S. Dollar Index. By the close, the price of silver gained 0.6% to $16.45. On Tuesday, June 7, the silver price saw a slight loss as the metal went into consolidation mode. Despite the DXY heading mostly lower, prices declined 0.7% to settle at $16.34. Silver prices marched above the $17 mark for the first time since May 18. By the end of the day, the metal posted a big 4% gain and closed at an even $17. Thursday saw more silver price strength. After falling below $17 in early morning trading, prices reversed, climbing 1.4% to close at $17.23 on the day. 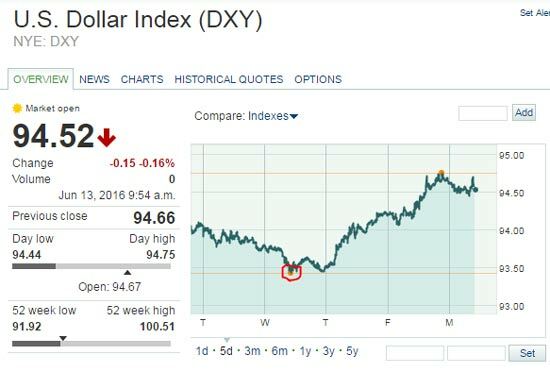 Again, this happened despite the DXY rising from 93.50 to 94. Once Friday, June 10, rolled around, the price of silver managed to post a modest gain of 0.3%. With that, the metal closed at $17.33 for a weekly gain of 5.9%. The first factor is recent volatility in global markets. Over the last five trading sessions, the S&P 500 and Dow Jones Industrial Average have fallen 0.1% and 0.3%, respectively. Meanwhile, Asian and European markets lost about 0.6% and 2.2% on Friday alone. Given the action of both silver prices and the U.S. dollar over the last couple of trading days, I get the sense that investors are looking to the metal for its safety appeal. As stocks plunged globally, precious metals and the dollar rallied as traders flocked to safe havens. 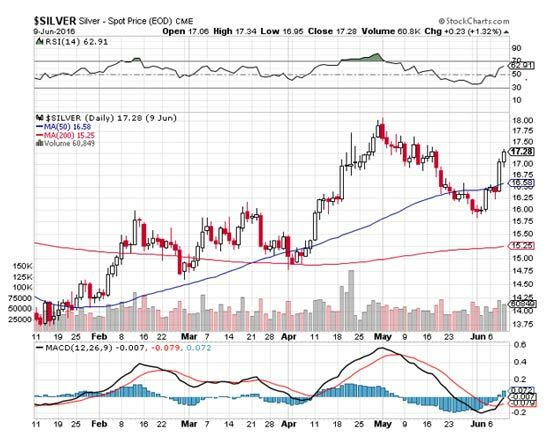 On Friday, silver had returned to the 50-day moving average. Now, prices have clearly moved above that line, while both the relative strength index (RSI) and moving average convergence divergence (MACD) – both of which measure the strength of silver's price movements – have turned upwards. Those trends provide bullish support for silver prices. This changes the near-term outlook, as the probability of further weakness is diminished. But I would not rule it out completely. Interestingly, gold and silver stocks saw a slight sell-off despite the metals prices moving up. Of course, the market's looking forward to this week's FOMC meeting, which is the second event that will move silver prices. After the dismal May jobs report, the markets seem to think the Fed won't raise interest rates. I don't think they will, and these odds are probably priced in by now. In fact, it wouldn't surprise me to see a weak silver price performance if the Fed decides not to hike rates. After all, it appears we're moving into a "buy the rumor, sell the news" scenario. 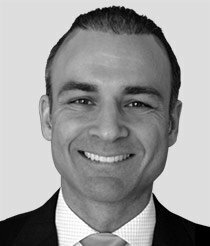 As for gold prices, I expect traders and investors will already be looking forward to the third macro issue – the Brexit vote on June 23. I think that will end with a small majority for Britain to remain in the EU. If that's the case, it could weigh on silver and gold as concerns dissipate. But globally, I see more market uncertainty, which will be a great boon for both gold and silver prices. Follow Money Morning on Twitter and Facebook for updates on the biggest silver price news.